Blackberry Playbook for sale ! | It-11 Audio / Tonegeek"
The BlackBerry PlayBook tablet is a solid piece of hardware with compact form factor and awesome support for multitasking. If you are one of these big fans of RIM Blackberry smartphones who’s been waiting for this tablet to go on sale… here it is, at last ! 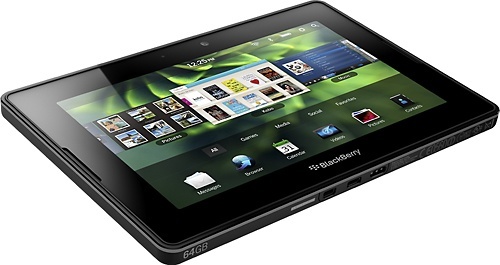 The BlackBerry PlayBook is now available in the US and Canada. The tablet has a 1024 x 600 pixel 7 inch display, a TI OMAP4 1GHz dual core processor and 16GB to 64GB of RAM. There’s no 3G for the time being, only WiFi and it is possible to pair the tablet with a smartphone for internet access. The 16GB model costs $500 (hence the price of a 16GB Apple iPad 2). The 32GB model runs $600, and the 64GB model costs $700. You can buy from retailers (Office Depot, Stapples, Best Buy, OfficeMax) or directly from RIM (Research in Motion). This entry was posted in What's up, doc ? and tagged blackberry, playbook, rim, tablet. Bookmark the permalink.